The Mopar Dodge Challenger V10 Drag Pak [sic] debuted just shy of a month ago and has already stormed its way into the NHRA record books. Driver Dave Thomas laid down a 9.43-second pass at 143.90-mph at a test session April 7, simultaneously setting the elapsed time and mile-per-hour records for the AA/SA class. Thomas's record is all the more impressive when you consider that he made his first-ever passes in the car the Sunday before the record run. With capabilities in the nine-second range almost as soon as it comes out of the box, we expect there are quicker times to be pulled out of the only V10-powered factory dragster. Less than one month after making its competition debut, the 2011 Mopar� Challenger V-10 Drag Pak is already rewriting the NHRA record books. Dave Thomas, of Westchester, Pa., powered his 2011 Mopar Challenger V-10 Drag Pak to a record-setting 9.43-second elapsed time (ET) at 143.90 mph during a test session on Thursday, April 7 at the NHRA Division 1 National Open event at Atco (N.J.) Raceway (the test session allowed for record attempts). Thomas captured both the ET and mph records in the AA/SA class just two weeks after taking ownership of his Mopar Drag Pak, and with only a few passes under his belt in the new V-10-powered beast. 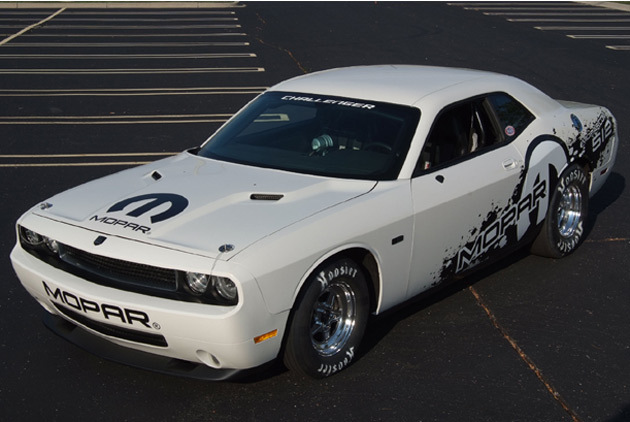 "In less than one month of competition, our 2011 Mopar Challenger V-10 Drag Pak has made its presence known in the NHRA Sportsman ranks," said Pietro Gorlier, President and CEO of Mopar, Chrysler Group's service, parts and customer-care brand. "Mopar is the only source for racers who want to purchase a factory-built, V-10-powered race-ready package car." "The first run we made in the car was last Sunday," said Thomas, who backed up his record with a 9.46 ET run. "We only had eight passes in the car prior to our first run down the track yesterday, which was the record-setter. I know I could have gone quicker. On the second run, the car left good but I let off at the end of the pass." "It's a spectacular car," added Thomas, who has been racing since 1971, in vehicles including a HEMI� Plymouth Barracuda. "We basically added weight bars to make minimum weight, and that was it. On its first-ever run, the car went a 9.79 at 137 mph. It's a turn-key operation. There are no headaches involved in setting it up at all. You just get in there and drive it. It's neat that the factory can make something like this." The 2011 Mopar Challenger V-10 Drag Pak, the first and only 500-plus cubic-inch V-10 drag race package car, was unveiled at the Dodge Viper Owners Invitational in October 2010. Based on the 2011 Dodge Challenger and finished in a Stock Eliminator and Super Stock configuration, the vehicle features competition wheels and tires, a Mopar solid rear axle with performance gear ratio, a 2-speed drag race transmission with integrated roll control, a complete competition fuel system with fuel cell, and a complete interior with gauge package. The race-ready package car made its competition debut when Frank Teuton Jr. entered his Mopar V-10 Drag Pak at the NHRA Gatornationals less than a month ago. Frank's brother, Joseph Teuton, took the car to its first class (AA/SA) win at the JEGS Cajun SPORTSnationals on March 18.